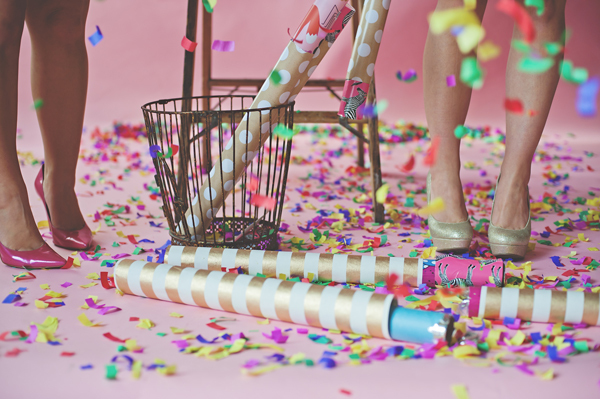 Is there a better way to start any party than with a massive confetti cannon blast? I think not. I tend to be picky about my stores, but sometimes I find a deal like mini-pies or confetti cannons that I cannot resist. 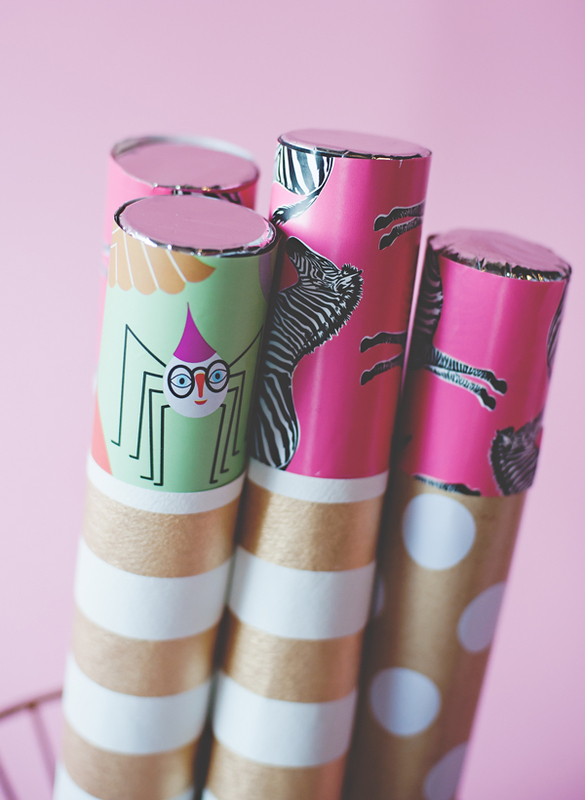 So we buy the cheap version, because it’s $5 and then we DIY it to make a handheld confetti cannon that is pure fun. What parties are a confetti cannon great for? These confetti cannons are not only crazy cheap, they also make an amazing showing at any celebration. And of course we set one off at midnight on NYE – in our living room! While buying the store out of these confetti cannons last month, I found myself wishing is that the confetti cannons were designed better. I quickly realized could be fixed with wrapping paper and a few pieces of tape. To update the confetti cannon to a sufficient festive design style I started with a couple different layers of wrapping paper. Step 1: Wrap just like you would a present, covering the outside but leaving the foil top of the cannon un-covered. Step 2: Wrap the top portion of the cannon in a coordinating paper. 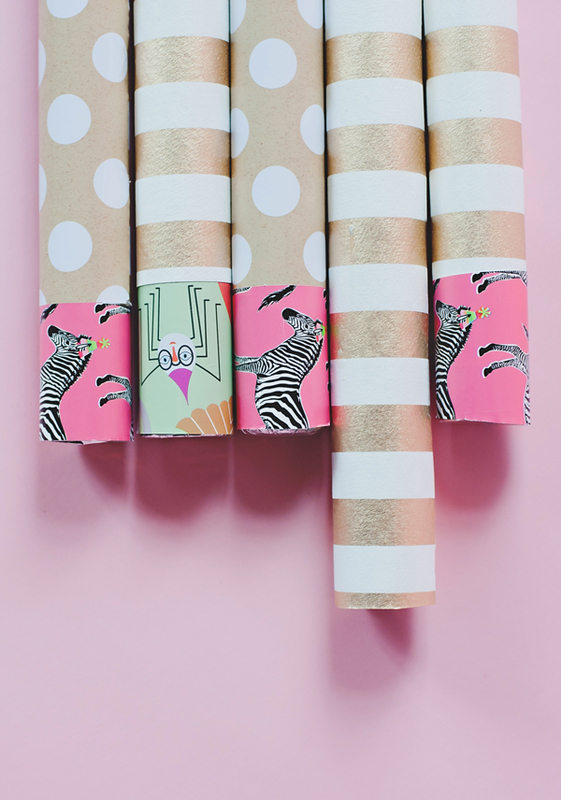 The double wrapping paper will allow the larger portion to stay in place while the small twist area gets removed. Step 3: Stash a bunch in a basket to call party goers into a fun confetti flurry. I adore how they look lined up in a basket waiting to be taken. Just to be fair warned, these confetti cannons are no joke. They make a pretty huge blast – which is super fun for a party! And they shoot a lot of confetti. I mean… A LOT of confetti! Confetti everywhere. I was surprised myself how massive the blast was and how much confetti filled the room after letting just two of these bad boys off. One of my favorite ways to use the confetti cannons are to create a gender reveal burst of fun. To create this you just need to switch out the confetti inside to your confetti color of choice. Step 1: Carefully remove the top foil of the confetti cannon and gently remove the confetti inside. 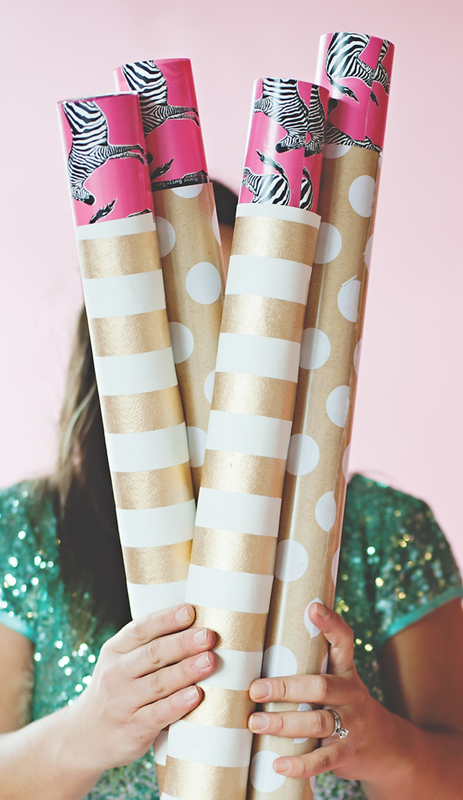 Step 2: Replace the confetti with the confetti color of choice and use a thin layer of masking tape to reapply the foil. 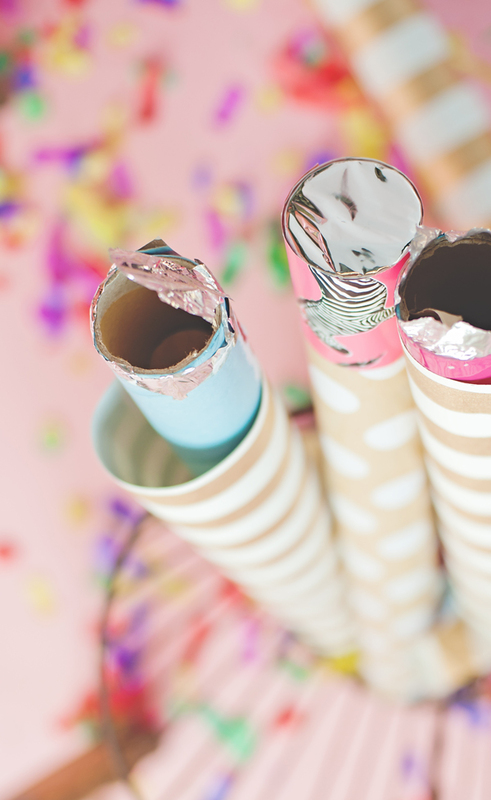 Step 3: Follow the directions above to create a DIY gender reveal confetti cannon that matches your style completely. 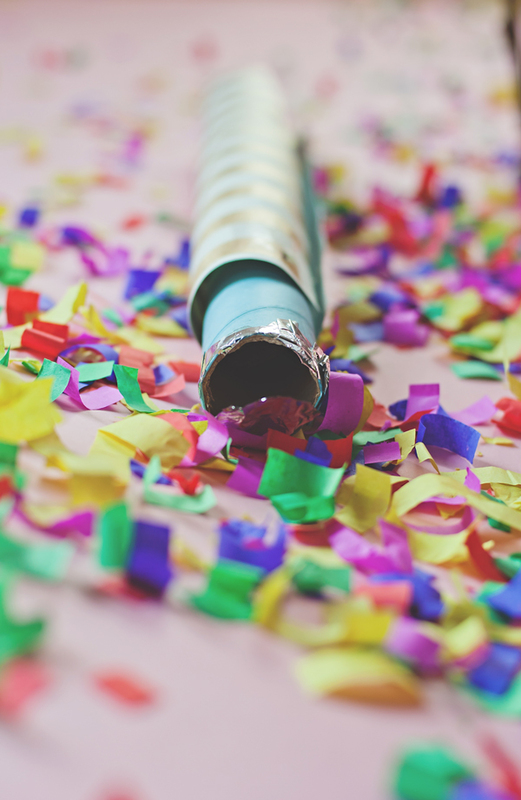 Shooting off the confetti cannons is simple – they work a bit like a biscuit can. To work it you will, twist off the small portion of the wrapping paper, then move your hands in opposite directions. Make sure not to point the cannons at anyone, anything glass, anything at all except the sky or ceiling above. 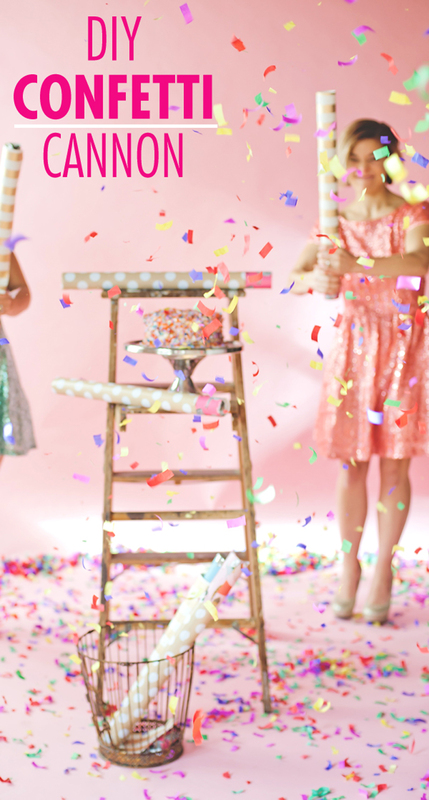 Be ready for a shower of confetti to descend on your celebration. 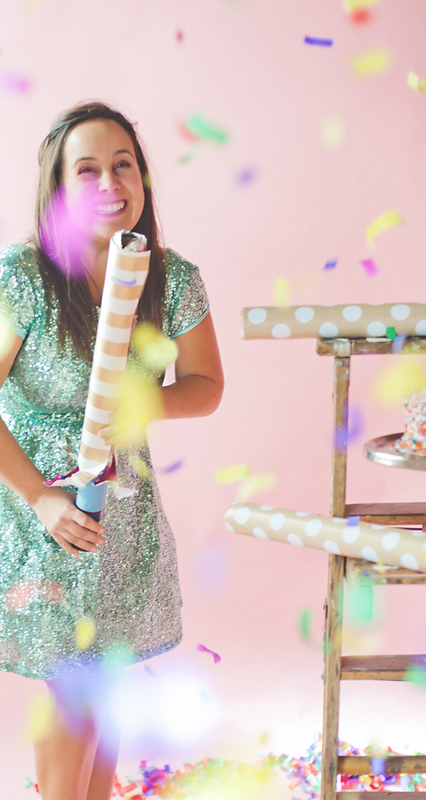 Confetti is always a good idea in my book – and I just love how festive and fabulous these DIY confetti cannons are at shooting it out. They’re a fun element to add to your party that guests will really remember. I got numerous friends commenting on what a cool mom I was to allow this kind of mess in our home. How I see it, some messes are totally worth it! Looks like a great fun project! Where do you find confetti blasters?! Love everything about this post! These are gorgeous! I love confetti! Hello, I love these! Where is the link to purchase them or what are the names of the cannons at Walmart or Amazon? Thank you! I still can’t find the link for the cannon? Has it been removed? Forgive me, but I don’t get it? I know this is an older post but if perhaps you still see it, could you maybe help. Step 2 is where I get confused. I would love to make them but I don’t get what would make the confetti blast out from the inside, what would actually give them force, how that work please?